Motorsport has joined forces with KONI to create an exciting new product, one of the most requested upgrades for early Z-Cars we've had, to replace (and improve upon) the departed Tokico HP & Illumina Adjustable Struts. 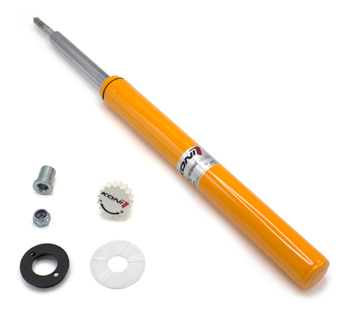 Completely new, constructed specifically for 70-83 Datsun 240Z, 260Z, 280Z, & 280ZX, these externally-rebound-adjustable, twin-tube low pressure gas-charged KONI Sport (Yellow) Struts are designed for use on both stock & modified street cars, as well as autocross & track day cars. Built to give a good balance of street ride quality and handling at the softer end of the adjustment range, the KONI Sports can easily be tuned up to nearly double the rebound damping force for more aggressive control needs: simply open the hood or rear hatch and turn the KONI adjuster knob. Not only can you tailor the struts to your local road conditions (and to your taste), you can also quickly and easily change the settings for a blast at a weekend autocross or mountain run, then easily re-set them for a relaxed ride home. Whatever suspension behavior you need is literally at your fingertips. Also, if you race on different tracks and race conditions, the adjustable damping gives you an edge in setting up your car specifically for any track or autocross course. Koni believes they will work great with Eibach Springs, and will be fine with even lower springs, as long as a proper bump stop is used. Let us know if you have any questions, [email protected] & I will get you an answer.